Once you click on it and login with your account you will reach the upload page, which will read the macro and display the properties. Check that everything looks ok and then click Submit. That should be it. The macro will be saved to the site database and I will get notified. I will be monitoring and approving each submission to protect everyone from a malicious macro that aims to corrupt your data. Your uploaded macros, once approved, will show up in Macroland with your screen name as the author, and other Onetastic users can download and start using them. I just tried the upload system with a new macro called "Insert Page at the Top" (as you see above) and it seems to be working, but if you hit issues, don't hesitate to ask so that I can get them fixed. I am sure some of you will hit something. You can see a list of your uploaded macros and their states and the number of downloads by clicking on Manage Macros from the account page. This update additionally adds some logging to the installer and the boot sequence of the addin to help troubleshoot issues several users reported regarding the installation. If you see issues like addin not loading or missing ribbon buttons, please contact me and we can gather the logs and see if they are helpful or not. There are some more fixes included and you can see the full list in the change log. And don't forget to try uploading your macros. In the meantime check out the new arrangement of Macroland where you can now see macros by popularity, category or recently updated. Hopefuly this will make it easier to navigate around and see what got updated recently. Ebay same style super saturday nfl shop to offer. Hi! Love this plugin and all the amazing people sharing their creations. I was wondering if there was a place to share template pages? I made a simple one that I think other students may enjoy. Please let me know! Thanks. martinitram: You can upload it with the correction and it will overwrite the old macro. Macro upload does not work on Microsoft Edge for me (though it works on Internet Explorer). The screenshot for macros are autogenerated. When there are multiple dialogs from a macro, it will pick one of them. I don't remember exactly how it picks but there is a way to specify which screenshot it is. You can contact me via e-mail if you want a certain screenshot to be shown. This can be made user configurable but I don't have that yet. I have posted a macro and it's up (and being downloaded!) Thing is, the screen show posted (automatically) is not what I would put as a screen shot. I have another macro that I would like to post, but again, the screen shot is quite miss leading (it's actually one of my error check messages). Is there a way to change/set what screen shot is posted? Would be nice to give a better idea of the output of the macro I have created. First of all thanks a LOT for the valuable time-savors you are providing around the world. It is nobody\'s guess that you have saved thousands of human hours for, starting from assistants to senior executives. Thanks Omer. It was a proxy that requires authentication, which we turned off for your domain. Anonymous: When installing macros, the installer will make an http request to this website. If there is a firewall blocking such a request, it could end up with this error. Check if you have a firewall software blocking such requests. Suspect its my end, but its doesn\'t give a clue as to what is blocked. The files seem to have the correct association. Like others have said, its after I click \"Do you want to continue\" in the Macro Installer dialog box. TheTranceFan, this issue is now fixed, please retry downloading the macro. There was a problem in the database and it should work now. Thanks for reporting. I created a macro and uploaded it (Insert Long Date). Since, I have tried to install that macro from MacroLand onto my other installations of OneNote and I get \"access denied.\" Why does that happpen? I did try running OneNote as administrator before opening the .onetastic file and that didn\'t help. Ideas? However, the macro \'Clean Authors\' (with Each Paragraph as the scope) and the I modified (with Each Outline as the scope) can not modify/remove that user-name in OE. That is why I want to know if OE is a specific issue. Also, OneNote\'s Find-by-Authors feature shows many pages having my old user name. If I click one item in \'Search Results\' pane, OneNote highlights the Date and Time below the page-title. To have my current user name for that element, I have to manually change the date and time (below the page-title). Again, the macro can not be used to modify those two elements\' author. As I mentioned before; personally, this issue is not a stopper for me to use OneNote. However, I think this can be a potential problem for users who rely on the Find-by-Authors feature of OneNote. DL-IND: The author info is kept at OE, if you modify that it will be as if the image\'s author info is modified (since Image itself does not specify it). Can macro modify author-attributes if they are within OE ? This is not a stopper, but it makes me curious. The macro I have arranged for cleaning authors by using \"<For each Paragraph…>\" and/or \"<For each Outline …>\" is/are not able to remove attributes related to authors if those attributes are in \"<one:OE …\". It is obvious if the outline element is the attribute of an image because the author initial appears on OneNote page. If I cut that image and paste it at its original position (simply do Ctrl-X then Ctrl-V), then my current author-name (DL2) will be applied. The other ones can be seen if I use the feature Find-by-Authors. Although OneNote does not show the old author on the page, there are so many pages listed under my old user-name. Thanks for the reply, Omer. I understand. Actually, I wanted to arrange a macro for attaching a tag to a paragraph and (at the same time) also highlighting some selected text in that paragraph. However, I face two issues; first, macro can not anticipate the dynamic changes of my tag-list; second, in OneNote 2010 paragraph, I can not make two or more separated-selections within a single paragraph (in MS-Word, we can select some words, push Ctrl, then select other words). Is it possible (someday) that we can make a \'main\' macro to sequentially run two or more \'sub-macros\' for various purposes ? 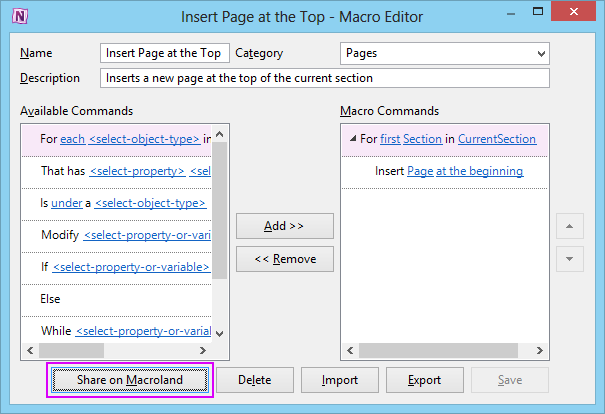 fr12345: Macros currently can only save the modifications to the page at the end of execution. For search and replace to update as you go, it has to be able to save the page in the middle of the execution, so that you see the changes. This feature currently does not exist. For indenting changes, I know there are some cases where this happens, but I haven\'t been able to track it down or find out the root cause. Though it seemed to me that once the indenting is changed by a macro, they will then be stable unless you change them back. DL-IND: The column structures only get created once the page is updated with the table, and for or the same reason I mentioned fr12345 above, this doesn\'t happen until the macro finishes execution. Onetastic could possibly create the column structure as you add rows and columns, but it currently doesn\'t. Also adding or removing tags aren\'t currently possible with macros. This could be added as an \"Insert\" statement under Paragraphs or other taggable objects. Again sorry this doesn\'t exist right now, but definitely asked for commonly. The list of tags is not exposed to addins, so Onetastic wouldn\'t be able to read that list, but if you know your own list I assume you would be able to create a dropdown with choices. Sorry, the question for my previous message is : How to make the <For each=\"Column\"> part work in that macro. Now, This one is about \"Tag\". Could you make a macro to show how a new tag is attached to a currently selected (partial) paragraph. I think I know how to modify the attributes of currently existing tags on a page, but have no idea how to attach a new one. Does OneNote read the list of tags; and if yes, can Onetastic macro read the list as well ? HI and thanks for this add-in! i am trying the search and replace. 1. i notice it just goes off and does the changes, all at once. it would feel safer it each change could be reviewed and approved, first. is that possible? 2. after it did the find and replace, i noticed the indenting of my outline points changed, and seemed less stable. any idea about this? Kevin, the logs are in %temp%\\Onetastic_*.log. Please send them to me via e-mail (See Contact link at the top) and we can have a look at what happened. I just installed Onetastic x64 without error during installation on a domain joined machine. When I attempted to launch OneNote 2013 x64 it immediately crashed. I noticed in the change log that you have logging for installation and startup, where are they located? Paul, did you have to create the file type association manually or did you only have to double click on the file? Paul just double click on the downloaded file. If that doesn\'t seem to work, try to associate the file extension with %programfiles%\\onetastic\\macroinstaller.exe. Robert46: Hi, this is not possible via macros (or add-ins for that matter) as OneNote does not expose any means for locking/unlocking password protected sections programmatically. DL-IND: Yes it would be nice to be able to resize Page XML window (and the Macro import/export windows). LayHar: Table of Content macro currently does not read the page contents. Not sure what you mean by pages that have todo box is not checked, as a page may have multiple todo boxes. Perhaps you are looking for Find Tags that is built into OneNote with summary pages? I have several pages with the same password in the same section. How to do a macro to open all pages together typing the password one time only. Can we have \"Page XML\" window adjustable ? It is very often that I just want to quickly take a look at some elements there without copying. I think it would be nice if I could adjust its window size (esp. its width) so that I would not have to scroll to the right and left. 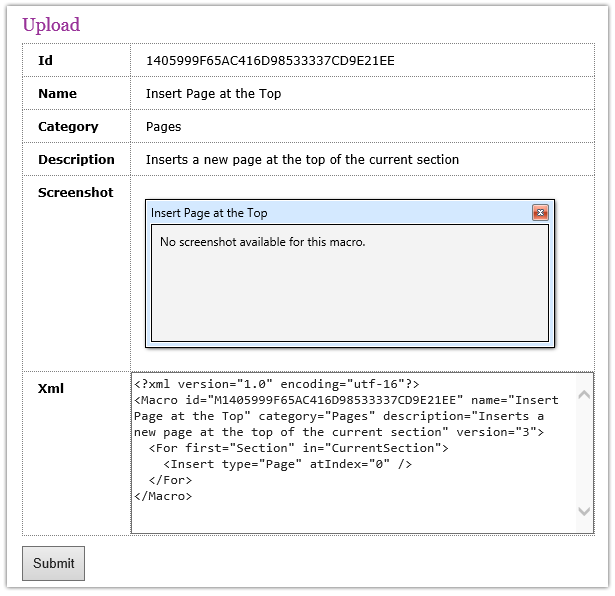 How to amend Table of Content macro so that only those pages that have their tagCompleted = false (i.e To Do box is not checked) will then appear in the TOC , together with the text string appearing at the To Do checkbox. Those pages with check box ticked will not appear in TOC? Been trying to solve it ... cannot find any onetastic basic structure and property tutorial so have to guess what things like LeftIndex , etc order. Still puzzeled and urgently need solve it. Appreciate any help. DL-IND: >\"Tag Incomplete\" (by GeoJono) failed.\"
This should now be fixed. For time zone, I believe it is not available right now. Andy: Which macro fails install? What is the command for inserting the current \"Time Zone\" ? However, the \"+07:00\" is inserted by using [... Add \"+07:00\" to it ...] . Can Onetastic macro read my current Time Zone ? I installed \"Search & Highlight\" with no problem. However, installing \"Tag Incomplete\" (by GeoJono) failed. Popup appeared saying \"Failed to download the macro\". I\'m getting an \"Access is denied\" error when trying to load a downloaded macro into Onetastic, right after I confirm that I want to add the macro. Any ideas on cause of this problem? Fantastic, thanks so much for making this tool available to us! It is about this site. 1. When I am already logged-in, I do not see \"Log Out\" on the pages I visit. To log out, I must go to \"My Account\" page. Should I be able to log-out from any page? 2. When I write a comment, there is a check box below my name: \"E-mail me if someone replies\". Can it be included in \"My Account\" under the \"E-mail Options\". Always send me E-mail when someone replies my comment. [checkbox] Yes. Always send me E-mail. [checkbox] No. Let me decide for each comment. Currently, once I forget to check it and click \"Send Feedback\"; I can not edit my comment. The new arrangement of Macroland is nice, Omer. If we sort them by Category and the category names were sorted \"alphabetically\" (A-Z); that would be better.